This handsome fellow is Darrel and he's a chick magnet! According to staff and volunteers at Wayside Waifs in Kansas City - where he is a favorite - Darrel is quite the ladies man and loves to give kisses. 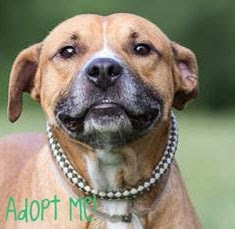 Darrel is a 6 year old Pit Bull Terrier mix. He was picked up as a stray and is being treated for heartworm and fly bites. It's a hard life on the streets. As you'll see in Darrel's adoption video, not only does he love people, he has excellent leash manners and already knows basic commands. Hi there, I'm Darrel. I might just be the sweetest, most loving dog you'll ever have the pleasure of meeting. I know, you've known lots of dogs in your life...but the people I've met here at Wayside say there's just something extra special about me. I make you feel good. I make you feel so loved. I make you feel like the most important person on earth. It's just the way I am and the only way I know how to be. Everyone needs someone like me in their life, don't you think? 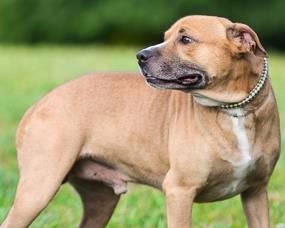 I am a handsome and cuddly, 6 year old, 46 pounds of solid love, Pit Bull Terrier mix who came to Wayside as a stray via the Belton, MO animal control people. Life has been rough for me, so it's pretty remarkable how I got to be so sweet and affectionate. 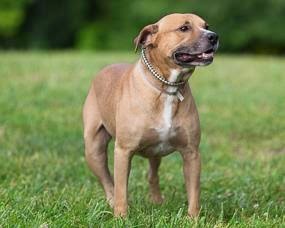 I'm a perfect example of how resilient dogs can be. I've already forgotten all the bad in my life and I live for today. I live for all the new friends I've met and the hopeful future that's now in front of me. I've spent the last month or so recuperating and I'm ready for my new life to begin! The scars on my ears from the relentless fly bites during the hot summer months will heal, as will the other sores on my body. And I'll get cured from the heartworm that I picked up along the way, too. Those things will soon be part of my past. I hope that in my new home, I will be loved and cared for the way I deserve, so that I don't have to endure these things any longer. I want to live inside, with you by my side, safe and secure and loved and cared for. I am sort of a shy and timid boy, at least until I get to know you. Once I have time to warm up to you though, I am the most loyal dog in all the world and I love to soak up all the attention you'll give me. I can't get enough of it! Please just give me time though, especially when we first get home, so that I can learn to trust you and relax with you. Be gentle and patient with me as I learn what you expect from me. Show me when I do good, by offering me your love and praise and a tasty treat every now and then. I will be a devoted companion for you for the rest of my life, once I figure it all out. I have quickly become a favorite of the volunteers at Wayside! I am calm and affectionate. I love to go for walks and I do just great on my leash, never pulling. I love to be by your side, feeling your gentle touch and listening to you tell me what a good boy I am. I will cuddle with you and give you kisses, if you like that. I am just an all around wonderful dog and total sweetheart! I do want to meet the whole family before we go home together, including all the kids and any other dogs you have. Truth be told, I would love to be your only dog, but I might get along fine with other dogs who stay calm and laidback with me and who know how to give me my space. I like to keep a big bubble around me where other dogs are concerned. With kids, well, sometimes their quick and unpredictable movements are scary to me. I'll be happiest without kids under the age of 5. Besides, I'm looking for a more calm and quiet home, so young kids don't really fit in with my plans. I am just a simple and sweet dog. I'm not looking for anything extra exciting in my life. A consistent routine with people I love sounds wonderful to me. I want to feel safe and wanted and loved. I want to show you the joy I can bring into your life, just by having me around. I want to be your best friend and loyal companion for the rest of my life. That's all. Wayside Waifs is Kansas City’s largest no-kill animal shelter. They are an independent, 501 (c) 3 not-for-profit humane society and animal welfare organization established in 1944. Wayside Waifs is committed to finding homes for all adoptable pets. Wayside is the largest pet adoption center in Kansas City, placing over 5,400 animals each year in loving forever homes. Wayside does not euthanize adoptable animals, and there are no time limits for animals in our care. Only animals suffering from significant medical issues or those that pose a danger are humanely euthanized. Wayside Waifs is proud to be a part of Kansas City's no-kill community. Talking Dogs blog is participating in the Tuesday's Tails blog hop hosted by Dogs N Pawz and Talking Dogs. This is the blog hop that features shelter pets. Find a pet at your local animal shelter or rescue and join us! Tuesday's Tails blog hop participants can post any day of the week and link up with a fresh blog hop linky every Tuesday. Though targeted at adoptable pets, we also welcome blog posts regarding pet adoption, rescue organizations and adoption events.Fetch the new Tuesday's Tails Facebook page and give us a like! Please help spread the word about these beautiful animals via social media and let's find them forever homes! A chick magnet? That means my sisters would go all drooly on him, they love boys! He's definitely a handsome guy!! The girls say "ooh, la la"! What a handsome guy, sharing. What a happy dog. Hopefully Darrel wins the heart of someone soon and finds his new forever home. I don't think this handsome fellow will be waiting long for a loving home...at least I hope not. He looks like a real sweetheart! Paws crossed he finds a home real soon! That is an adorable video!! Darrel definitely does seem like a heartbreaker! :) Sharing! A happy face like that with good leash manners? He will make the perfect companion for someone. Glad he's at Wayside - they sound like a great shelter. Sharing. He is so lovable! I hope he finds a great home soon. Sharing him! Such a handsome and sweet face. We will share too.